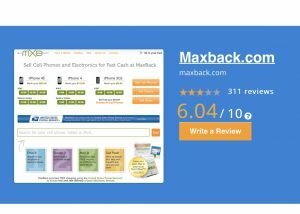 MaxBack Review - Is This Site Worth A Look Or Not? 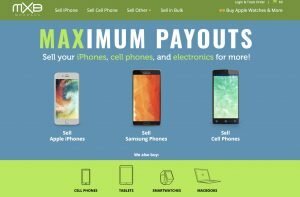 In this review, the pros and cons are examined of selling used devices to MaxBack.com. The devices they buy are somewhat limited, but their payout times are fairly quick. MaxBack is somewhat enigmatic because of its muted online presence, but a close read seems to suggest that it’s a perfectly average site for selling your old iPhone. Sean has a 20-year track record of creating and growing Internet-based businesses. He is one of the founders of FundingFactory, a groundbreaking, fundraising-through-recycling program for schools and charities. 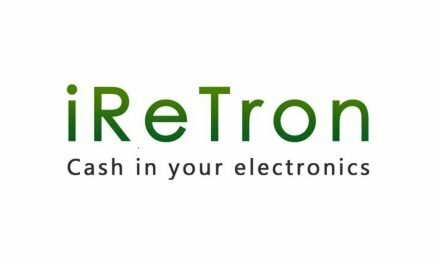 Through FundingFactory, participating organizations earn funds by collecting empty printer cartridges, cell phone and other consumer electronics products. More than 50,000 organizations have benefited through FundingFactory, collectively earning more than $60 million in funding from their recycling efforts. Sounds like an interesting guy! He clearly cared about this business on some level to reacquire it, which bodes well. That said, MaxBack, of all the sites we’ve looked at in doing these reviews, keeps a low profile in terms of reviews and complaints. They’re listed under ERS at the Better Business Bureau site, and ERS gets a de facto A+ as there are no reviews or complaints at all on their page. It could be a good sign, but it seems a little fishy that they don’t have much in the way of outside validation to offer. They don’t appear on many other well-known review sites, and though they were mentioned on cnet and in the Wall Street Journal back in 2016, that’s the extent of their coverage or accolades. While no news can, as they say, be good news, it’s worth keeping in mind that they seem to have avoided the sort of mass online reviews that give people space to compliment or lodge complaints. It could mean you may have less of a forum for recourse if something does go awry. Or it could just mean they have a sterling record. Who knows? Now, on to the good stuff. 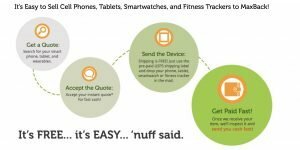 Maxback is somewhat more limited in their scope than other sites: they buy back iPhones and other cell phones, Apple watches and other smart watches, iPads and tablets, and MacBooks. Also unlike those other sites, they focus on slightly more recent models: the oldest iPhone they offer a quote on is the iPhone 5S. The quoting process is very easy! They use the same system as most of these sites: simply click various options to best describe the device you want to sell (model, capacity, condition) and they’ll instantly provide a quote. Their selection of items they’ll buy may be more limited, but the benefit of that is that it seems they’ve set up all devices they’ll buy with that easy, just-a-few-clicks system, as opposed to some sites that make it easy to sell iPhones but aren’t as well set up for other devices. They offer a free USPS shipping label and free shipping for returns on anything that’s requoted. They’re fairly standard in that sense, but hey, free is always good! 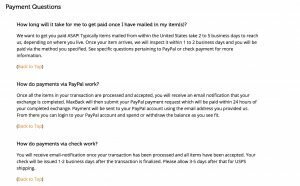 For customer service, the site looks deceptively simple, but they offer a contact form, phone number where they can be reached Monday-Friday between 9 and 4 pm EST, and list an email at the base of their site. Additionally, MaxBack seems to be active on Facebook messaging – good to know if you really needed something fast or wanted to try a different channel. The lack of reliable reviews online makes it tough to gage any patterns when it comes to the quality of their customer service, but at least you’ve got a few different options to try to get a hold of them if there’s an issue. 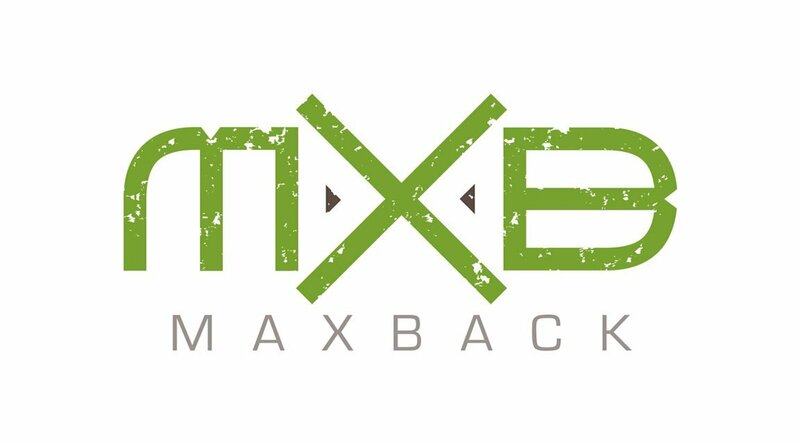 There are a few little extras to take into consideration when it comes to MaxBack.com. 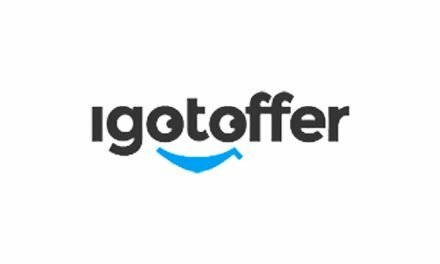 You can get a $5 promo code when you sign up for emails and there are often seasonal discount codes and bonus promo codes on the site. 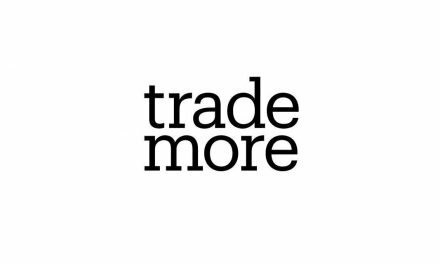 Additionally, they move fairly quickly on their payouts and they offer 30-day price lock and “no risk” policies. They’re not necessarily breaking any new ground with these fairly standard promises, but better to have these than not! Their payout quotes tend to be in the mid-to-low range relative to other sites for the devices we checked. 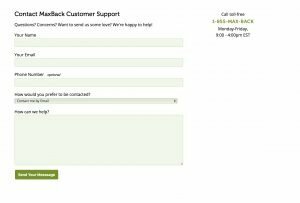 MaxBack isn’t going to offer you the worst price out there by any means, but it may be an exaggeration to say they’ll help you get the, well, max back. The apparent moratorium on consumer-based online reviews of MaxBack except for TrustPilot (which rates them highly) and ResellerRatings (which rates them on the low end) is a bit disconcerting. It’s possible they’re just doing everything right, but it seems unlikely. The lack of transparency there makes you wonder what the complaints might have been; it makes it hard to discern what their strengths and weaknesses might be, which may be doing them as much harm as good. Better the devil you know, as they say. 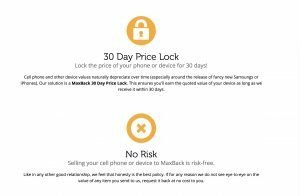 All that said, their payouts are fast and there are no pitchfork-wielding mobs readily apparent, so if you find a quote for your device that works for you, MaxBack may well be a good choice! There are only a handful of reports of requoting online, and the site states upfront on their website the situations where a requote may be given and that it sometimes happens. For selling your used devices, as buyback companies go, MaxBack seems to sit in the middle of the road. They offer all the standard services and benefits you’d expect (if not much more). So poke around the site and, in the end, go with your gut! 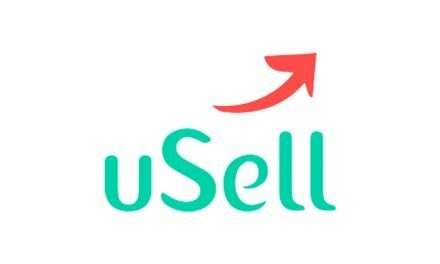 NextGizmogul.com Review – To Sell Or Not To Sell Your iPhone?